After 25 years of being involved with greyhound adoption, I'm sure you can imagine that I have seen my share of greyhound puppies along the way. Whether they are coming from an adoption program or directly from the breeder, often it's because they have a defect or medical condition of some sort. Leg problems are probably the most common because the mothers sometimes roll over on their puppies and permanently damage their little legs to the extent that they cannot race. We have had deaf puppies, a puppy with a pancreatic deficiency that will be on medication for life and puppies with multiple other ailments. We've also had some 'perfect' puppies that, for some reason or other, could not be registered. Regardless of how or why they came to us, they have all been wonderful and we are always happy to take them. Sadly, these puppies are generally euthanized at the breeding farms if they can't race even though they could still lead a very happy life outside of the racing industry. Most adoption programs that acquire puppies generally know if they have any medical issues and should/will absolutely pass that information on to potential adopters. Interested adopters should not be shy about asking questions to ensure that they are ready to take on whatever physical, emotional and/or financial commitment may be necessary. 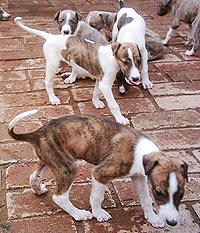 Greyhound puppies, in any condition, are certainly a change of pace and provide a completely different experience than settling in with a former racer. Puppies are much more labor intensive. If you decide to take on a puppy, you need to be home a lot. Puppies need to eat, sleep, run, play and get tired several times throughout the course of a day. They need to be fed multiple times a day and taken out 15 minutes after they eat and 15 minutes after they wake up from a nap. If they are taken outside at those times, that is most likely when they will relieve themselves. Unfortunately, if they're inside, that's also where they'll go. Routine and frequency are key elements in getting a dog housebroken and can be a challenge if the adults in the family work during the day, leaving the puppy home alone. Usually, if a dog is returned because it 'can't' be housebroken, it's usually a problem with the adopter not willing or having the ability to appropriately train the dog. Rarely have we seen dogs that cannot be housebroken. It is important to remember that you are molding this puppy. If you screw it up, take responsibility and continue to try to get it right instead of passing the problem along to the next person. If you mold it properly, you will have the most wonderful dog and so many memories of raising it from puppyhood. Of course, if you take a puppy, you are passing up the opportunity to take on a fully grown greyhound that really needs a home to survive and will be much easier to settle in.